In hermetic and seam sealing applications utilizing pulsed laser welding, it is critically important that weld spots are evenly spaced, overlapping to form a continuous welded seam. 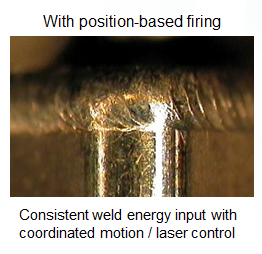 Traditional pulsed laser welding approaches attempt to do this by firing the laser at a constant repetition rate. While this can be made to work along straight lines or other paths that can be traversed at constant speed, the result is sub-optimal and the approach really falls short when welding along irregular contours. For example, it does not work well for hermetically sealed packages, such as implantable medical devices, aerospace sensors or electronics modules.